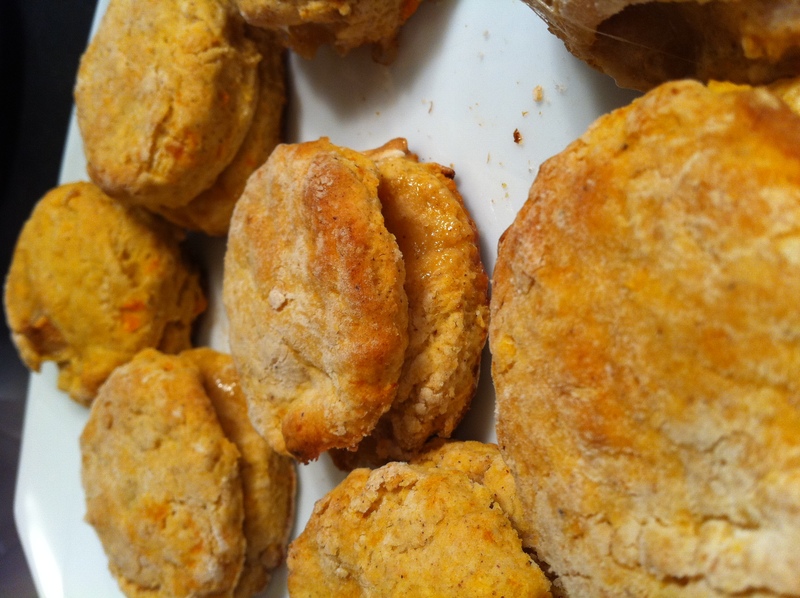 There are lots of things I miss about Atlanta now that we live in North Carolina, and the sweet potato biscuits from Highland Bakery are most definitively on that list. But we’re gathered here on the interwebs today to talk about the biscuits. Sounds like they’re worth a try, so here goes. A couple of hours before you want to begin baking, roast sweet potatoes in a 400 degree oven for about an hour, until they’re completely soft. Cool, peel, and mash, then wisk in buttermilk and set aside. Leaving oven heated at 400, line a baking sheet with parchment paper or a Silpat (my personal choice) to have it ready to fill with delicious dough in a few minutes. In a large bowl, wisk flour, baking powder, sugar, spices, and salt. Using a pastry blender (if you have one), add in the cold butter. 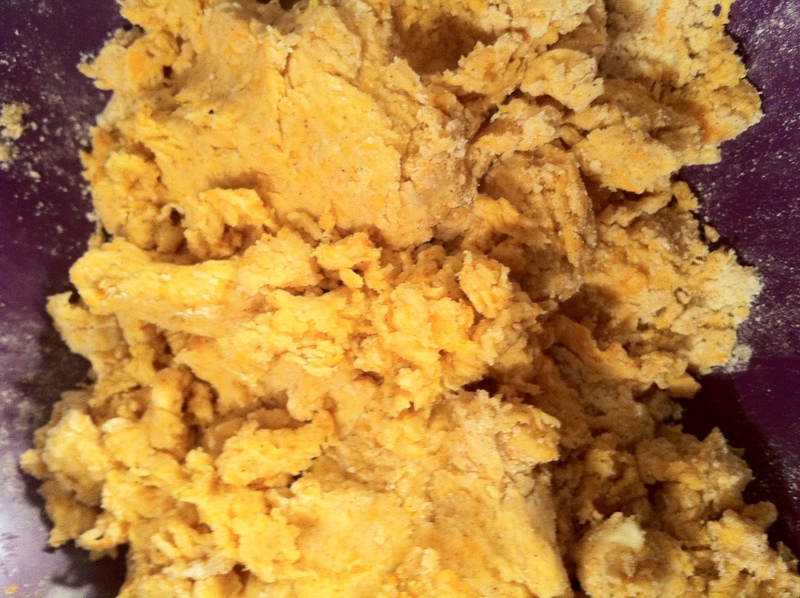 (If you don’t have a pastry blender, just chop the butter into small-ish pieces and then mix those into the dry mixture.) Mix well. 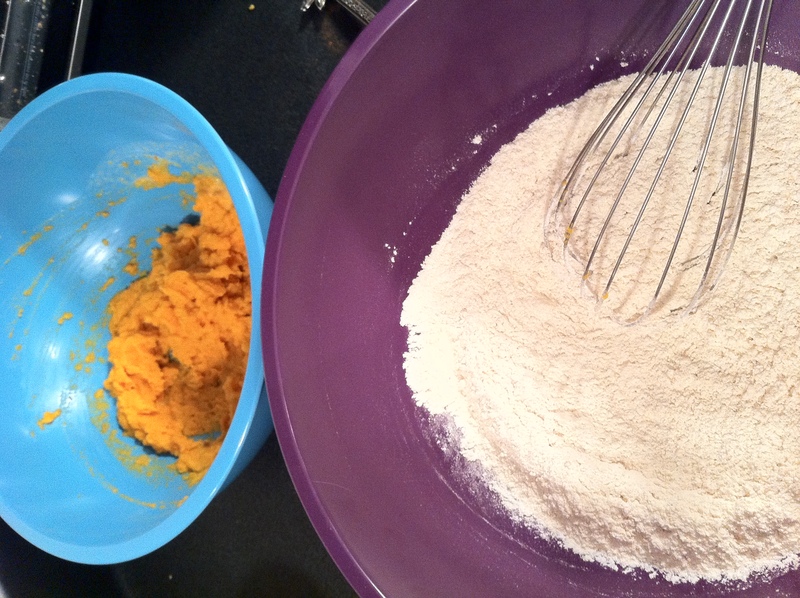 Add the sweet potatoes into the dry mixture (it’s easiest to use your hands) and knead gently until completely combined. Using a floured surface, pat dough out to a 1/2-inch thickness and divide evenly in half. 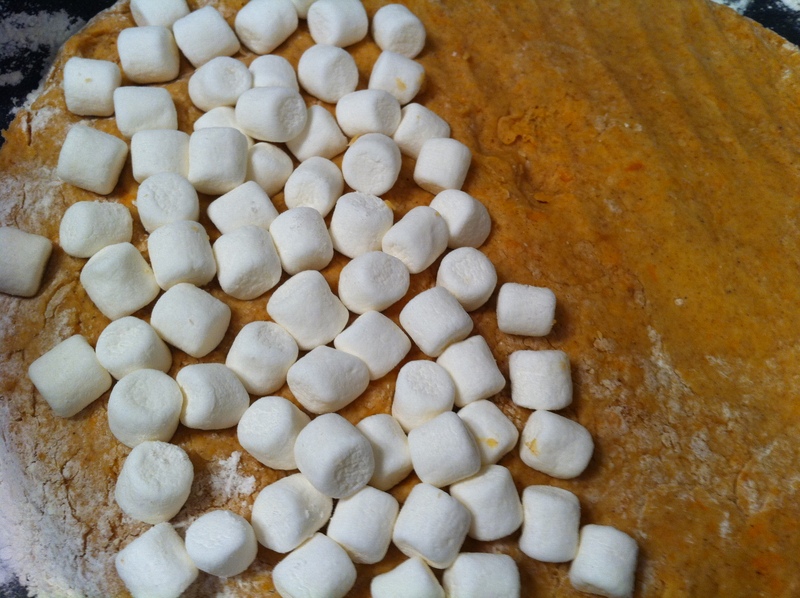 Sprinkle marshmallows loosely over one half of the dough. Place the second half on top of marshmallows and gently press the sides together, keeping the final dough thickness at a full inch. 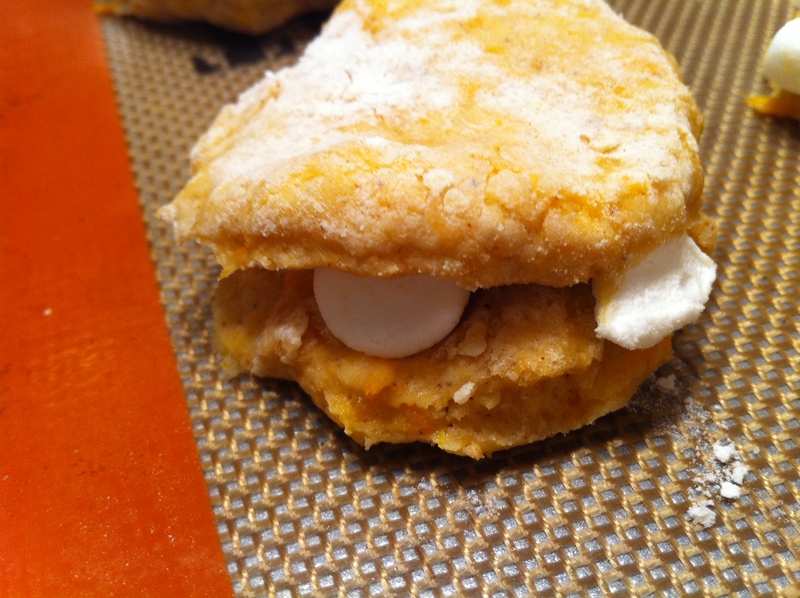 Dip a small biscuit cutter in flour, then form biscuits by cutting straight down without twisting. (This helps the biscuits rise better. Who knew?). Bake biscuits on prepared baking sheet for 10 to 13 minutes, until puffed and slightly golden on top. The verdict? These aren’t nearly as magical as the Highland Bakery’s version, but they are quite delicious. Since I was in an experimental mood I made two batches and (thanks to an astute suggestion from Kevin) added about three tablespoons of brown sugar to the second batch, which I think was a good move. I’m still on the search for wonderful sweet potato biscuit recipes, though, so please point me in the right direction if you’ve got one!